John Middleton Clayton was appointed Secretary of State by President Zachary Taylor on March 7, 1849, and entered duty the next day. He resigned the position on July 22, 1850, shortly after President Taylor died and Millard Fillmore assumed the Presidency. Clayton served during a difficult administration and suffered frequent criticism despite the fact that he wielded little influence under Taylor. Clayton was born in Sussex County, Delaware. He attended multiple academies there before entering Yale College. He graduated in 1815 and apprenticed in the law office of his cousin, future U.S. Senator and Delaware Supreme Court Justice Thomas Clayton. After studying law at the Litchfield Law School, Clayton was admitted to the Delaware bar in 1819. 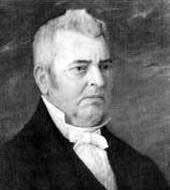 A successful lawyer, he entered politics in 1824 when he was elected to the state legislature. Clayton served two years in the House of Representatives before he was appointed Secretary of State for Delaware. He held the position until 1828 when he was elected to the U.S. Senate. Clayton served during the Nullification Crisis, when South Carolina’s attempt to nullify federal law threatened the Union and created one of many fissures leading to the Civil War, as well as during the Bank War, when President Jackson controversially vetoed the federal charter of the Second Bank of the United States. Clayton left his Senate seat in 1837 to spend time with his family (his wife Sarah died following the birth of their second child and Clayton never remarried). During this time, he was appointed Chief Justice of the Delaware Supreme Court with the support of local Whig leaders. He left the bench in 1839 to campaign for William Henry Harrison but failed to win a position in either the Harrison or Tyler cabinets. In 1849, President Taylor appointed Clayton U. S. Secretary of State on the recommendation of Kentucky Governor John J. Crittenden. Clayton’s tenure as Secretary of State was marked by war scares with France and Portugal, opposition from both houses of Congress, and troubled diplomacy. Clayton pushed for a strict adherence to the Monroe Doctrine, and managed to keep British influence in abeyance. They key achievement of the Taylor administration was the Clayton-Bulwer Treaty over building a proposed Anglo-American canal through the Central American Republic of Nicaragua. The canal never went beyond the planning stages, however, and was supplanted by the canal in Panama. Upon the death of President Taylor in July of 1850, Clayton immediately resigned his position.